Tempers have risen in the SF Bay Area over the past few months due to sky-rocketing rental costs (the average cost for a 1 bedroom in the city was $2800 this past July). The cost increases are attributed to an influx of well-paid tech workers, many of whom actually work outside the city, down at Google, Facebook, Yahoo, Apple or one of the numerous other tech companies that litter the Silicon Valley peninsula. Increased demand for housing among well-paid tech workers plus stagnant supply means rising costs, and boy have they risen. 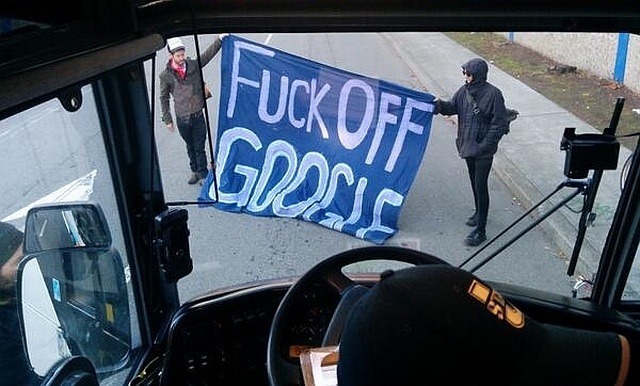 The tensions have a natural focal point in so-called Google busses - private busses that cart tech workers down to their jobs every morning and back again in the evening. These busses conduct their pickups on public streets and at public bus stops and the sheer volume of them slows down traffic flow and regular public transportation for the rest of the city. Most recently, protesters blocked a bus from departing and smashed a window in frustration. Now, it's not fair to blame these sweeping economic forces on the individual workers - who wouldn't take a great job in a great city with great pay if they had the skills? Terrorizing individual workers who bus to work (the busses are a great decision from an environmental standpoint) is a decidedly bad response to the rising economic pressures, but the protesters do have a point. The rising rent costs and crowded public streets are benefiting corporate entities outside the city by providing their workers with a great place to live. These companies are headquartered outside the city limits, minimizing their tax burden in the area they are impacting. That means they aren't held liable for the constraints on public services caused by the systemic influx of their workers. However, those corporate entities who claim to be good corporate citizens have a responsibility to respond proactively. Here's why this is a classic corporate sustainability issue. "Information on [sustainability] performance should be placed in context. The underlying question of sustainability reporting is how an organization contributes, or aims to contribute in the future, to the improvement or deterioration of economic, environmental and social conditions, developments and trends at the local, regional or global level. (emphasis mine) G4 guidelines, p 10"
What that means for reporting organizations is that it isn't enough to report on good works, like the procurement of clean energy, or community service projects. If the organization has any substantive impact - positive or negative - in the local community, it belongs in the CSR report. GRI doesn't expect organizations to report on all impacts, only the material ones. Organizations must report on issues that "reflect the organization’s significant economic, environmental and social impacts; or  substantively influence the assessments and decisions of stakeholders. G4 guidelines, p 11." If a company like Google's operations are having a measurable impact on the city of San Francisco's rent prices, that qualifies as a significant economic and social issue. And if community stakeholders are bothered enough by the busses to protest them, well a good sustainability report would reference their concerns and plans to deal with them. Will we see this issue mentioned in future reporting? Despite all the calls from GRI and other reporting advocates for companies to look closely at their local impacts, actually getting these impacts into the reporting is another story. Sustainability departments are already strapped, tracking dozens if not hundreds of social and environmental issues around the globe. Despite the clear materiality of this issue for Bay Area tech organizations, it may not show up in CSR reporting unless it occurs to someone in the sustainability department and that person can successfully make the case internally that the issue crosses the materiality bar. It's admittedly a high bar, given the number of issues competing for the team's attention. So consider this a call to action, sustainability reporters! This stakeholder believes the rent and congestion issues close to your company's headquarters deserve to be covered in your sustainability reporting. Reporting is one thing, but actually acting to positively improve is, of course, the ultimate goal. Google issued an email statement after the bus smashing incident, stating that, "We certainly don't want to cause any inconvenience to SF Bay Area residents and we and others in our industry are working with SFMTA (San Francisco Municipal Transportation Agency) to agree on a policy on shuttles in the city." So the tech giant does appear to be actively working, at least on the congestion issues. That's good news for sustainability reporters who can cover the issues raised by stakeholders in their next round of reporting, as well as their corporate progress in addressing them. Rent prices in the city are a more difficult challenge for a corporate entity to address, as Google certainly can't control where it's employees choose to live, nor can they singlehandedly impact the zoning regulations which limit supply in the city. Nevertheless, they can use their money and power to lobby for increased housing developments in cities throughout the Bay Area. They can work with the transit agencies to increase public transit between San Francisco county and counties to the south where tech companies reside, such that the transit routes Google and Apple have created for private use become an accessible public good. They can even build some of their own corporate housing, like Facebook, or work to make Silicon Valley a more desirable place to live. Readers, what do you think? Are the local congestion and housing cost issues a core sustainability issue for tech companies? If so, what should they do about it? Weigh in in the comments!